DVD: Geneon Entertainment (Japan). Language: Japanese with English Subtitles. Ratio: 4:1. Length: 79.00. Region: 2. When discussed in the West, the term “anime” is frequently used simply as a genre label to identify often violent, sexual and puerile cartoons from Japan. This is, of course, grossly inaccurate, not only marginalizing the term itself but also the work to which it refers. In Japan, on the other hand, anime covers the breadth of animation, restricted by neither genre nor nationality. It is testament to these contrasting attitudes that Koji Yamamura, an animator celebrated in Japan, remains largely unknown on these shores. Eschewing the ‘superflat’ imagery typified by Japanese animation, Yamamura styles his films with the marks of his assured, if occasionally rough-hewn, hand. “I don’t think animation done by big production companies is interesting”, he told Time magazine. “Images become watered down and too uniform […] they’re not based on an observation of reality.” (1) This notion of reality is principal to Yamamura’s work that often takes the form of imaginative flights of childlike fantasy. Unlike his contemporaries, however, Yamamura’s worlds aren’t located in far-away galaxies or distant futures, but, more tantalisingly, in the minds of his young protagonists. Here, children can swim in the puddle of a spilt glass of water (Kid’s Castle, 1995) or literally lose themselves in a book (Bavel no hon (Bavel’s Book, 1996)). Yamamura’s work may be built upon an observation of reality but it certainly isn’t restricted by it. Assuming the title of Yamamura’s most internationally successful film, this generous anthology, although not definitive, showcases the artist’s evolving aesthetics and recurrent themes. As the main feature, Atama yama (Mt. Head, 2002) inevitably carries a certain weight of expectation. It is undoubtedly Yamamura’s most recognisable and accessible work to date, but the short might also be his most traditionally Japanese film. 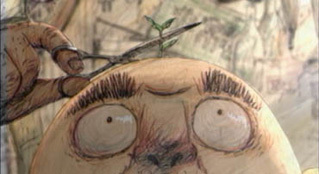 Nominated in the Short Films Animation category at the 75th Academy Awards (Eric Armstrong’s The Chubbchubbs left with the statue), the film is adapted from a traditional Rakugo story in which an amusingly plump man with a waste-not-want-not mentality eats a cherry pip, unleashing curious side effects. Takeharu Kunimoto’s narration and shamisen soundtrack are impeccably delivered to recall the comical monologues essential to the Rakugo art form. Visual traits of Rakugo are slightly harder to reproduce in film, as a result Yamamura only once animates the form’s inherent comical body gestures; as Kunimoto announces “Salary men are in bloom, office girls are in bloom”, a closed huddle of professionals contort themselves to resemble a seasonal cherry blossom opening. Furthermore, Yamamura’s contemporary setting imbues the film with a very modern subtext: the shifting relationship between tradition and modernity. The protagonist, designed like a Raymond Briggs character bordering on the grotesque, is one of the only figures in the film to wear traditional attire and later develops a much more surreal signifier of traditional Japan. Inexplicably, a cherry tree sprouts and grows atop his head. Initially, his curiosity leads him to carefully trim the tree, but, eventually irritated by disrespectful visitors who gather under its bough, the tree is forcefully removed and ultimately lies discarded in a bin. Later, in what is Yamamura’s most overtly psychedelic sequence, the man sits atop his own head staring into the resulting void. The mind-bending experience is visualised as an endless cycle of repetition in which the viewer is literally thrust into the character’s head only to reveal the same scene played again, and again and again. Whether made as a comment on contemporary Japan, or more simply for æsthetics alone, remains pleasingly in the eyes of the audience. Unlike other filmmakers, Yamamura ensures that, even if viewers choose to ignore the subtext altogether, the plot and imagery remain sound and unaffected. Mt. Head, however, isn’t the only highlight. 1987’s Suisei (Aquatic), the earliest short on the DVD, opens with the sound of water dripping in darkness before we are introduced to a man rendered in beautifully fluid water colours. Yamamura drops traditional narrative devices and is instead motivated by an æsthetic playfulness that continues throughout this collection. In the long-standing tradition of animation history, Yamamura appears to be infatuated by the idea of metamorphosis – in this case the protagonist’s reflection morphs into a fish, a seahorse and countless other deep sea denizens. Similar concerns re-appear semi-regularly right up until Pieces (2003), the most recent film featured here, in which a series of vignettes dazzle the viewer with their meticulously detailed scenes of movement and transformation. The DVD also includes the complete Karo and Piyobubt series. All three instalments feature the titular birds in situations that ordinarily might be considered mundane. Episode one sees the duo build a tree house, in episode two they make sandwiches and in the final episode they daydream to avoid the rain outside. Of course, Yamamura enlivens the scenarios dramatically. Made predominantly using claymation, the series has a DIY charm reminiscent of Aardman’s early Morph shorts, particularly in their sound design. The most arresting image, however, resumes the watercolour technique seen in Aquatic. In episode three, as Karo and Piyobubt competitively conjure objects from their imaginations, we see a whale literally poured from a snail’s shell and an alligator absurdly climb from a banana skin. Kipling Jr. continues this motif of home and like Karo and Piyobubt is made largely with claymation. Perhaps due to the film’s extended running time (15 minutes), it stands as one of the weaker films on the DVD. Kip, the adolescent main character, leaves his rural home and eventually finds himself lost in an unfamiliar city. Simple premises are common in Yamamura’s work, but Kipling Jr. lacks the striking imagery and flourishes of imagination that makes such narrative simplicity a blessing. Elsewhere, Yamamura’s films display a more educational grounding, most notably Hyakka zukan (Japanese – English Pictionary, 1989). 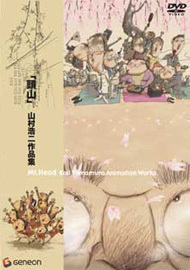 The film offers a string of Japanese and English words, each informing the next, astonishingly visualised using the breadth of animation techniques. A stop-motion military figure is awarded a string of medals (decorations …) until he is completely buried (… scale …), later, he emerges as a sprightly royal (… emperor …) who rapidly ages before finally disappearing in a delicate wisp of air (… retirement). How much education you gleam from the film is questionable and perhaps beyond the point. Yamamura’s comprehensive demonstration of animation techniques, not to mention the logistics of such a seamless flow of Japanese and English, is hugely impressive in its own right. Docchi ni suru! (Your Choice!, 1999) continues in a similar vein. Credited to Yamamura and “The Junior Directors”, the film was a collaborative project made with assistance from American and Japanese school children. The short humorously illustrates a series of everyday choices – Should I carry an umbrella? Should I not? Should I visit the dentist or get a hair cut? – in a simple hand-drawn style that literally pulsates on screen. Like many of his other films, Yamamura chooses to tell his story through images instead of relying on explanatory dialogue, ensuring that his audience shares a similar experience regardless of nationality. Although narrative based, Your Choice! is unburdened by conventional logic, precisely because of its collaborative origins. At one point, a towering tyrannosaurus rex appears unannounced in need of a dentist, surely a testament to the fertile imaginations of the children involved. This notion of childlike wonder is further evidenced in Enkinhou no hako: hakase sagashimono (Perspektivenbox, 1990). The film mixes cell-animation and found objects to tell the story of a researcher avidly cataloguing the inhabitants of a contemporary Japanese city. Walls are adorned with barcodes and the streets populated with creatures culled from both reality and fantasy. Despite wearing an overpowering grey moustache, Yamamura lays visual clues to suggest the researcher is in fact a child – he is dwarfed by a stream of anonymous salary men and oversized objects loom throughout. Or perhaps the film is a subtle critique of modern society, where people lost in emotional isolation appear alien to one and other. In any case, like Yamamura himself, the researcher’s observations of reality are irrevocably transformed by his imagination. Watching this collection, a few things become very clear, very fast. Yamamura is not a typical animator, not in the Japanese mould or any other. He is certainly true to many animation traditions – his films are often aimed at a young audience; his characters are frequently anthropomorphic – but the delivery is uniquely his own. Yamamura’s fascination with transformation isn’t limited to the confines of his narratives; in fact, it is precisely because of his own stylistic transformations that his work is elevated above restrictive genre labels, making this such a valuable collection. Yuki Oda, “Redrawing Rules: Koji Yamamura is a Lone Wolf in the World of Assembly-line Animation”, Time (2003) (accessed August 2006). Paul Jackson is a freelance writer and recent Film Studies Graduate.